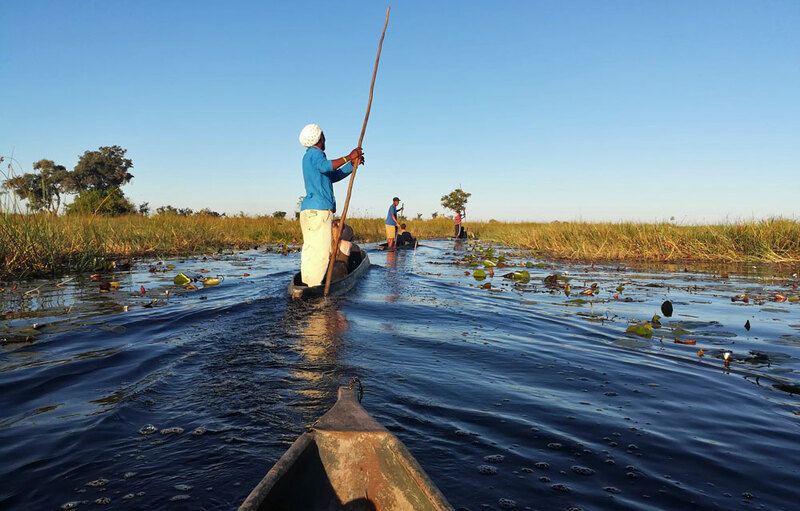 If you truly want to experience Africa at its wildest, there’s no better way to do it than with an Okavango Delta mokoro ride. 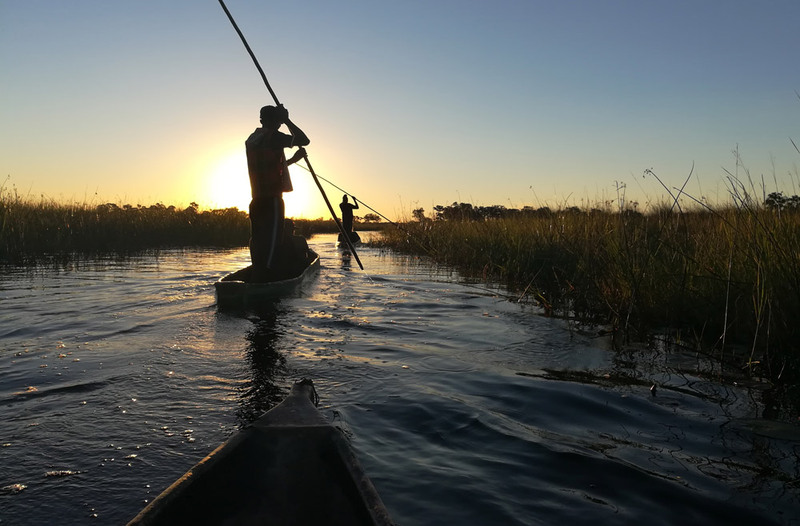 The Delta is nearly 5 million acres of swampy marsh and grassland in northern Botswana, and the mokoro is a traditional canoe used to navigate the area’s challenging terrain. 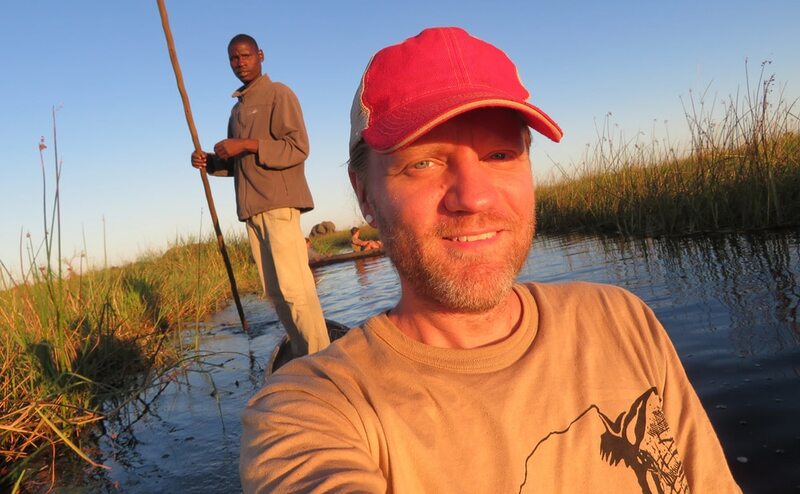 Nothing makes you feel like you’re completely in the middle of nowhere like being paddled by a local guide through watery channels between tall grasses out to a small island in the middle of the Delta, with wild hippos, elephants, and hyenas serving as ever-present dangers around you. 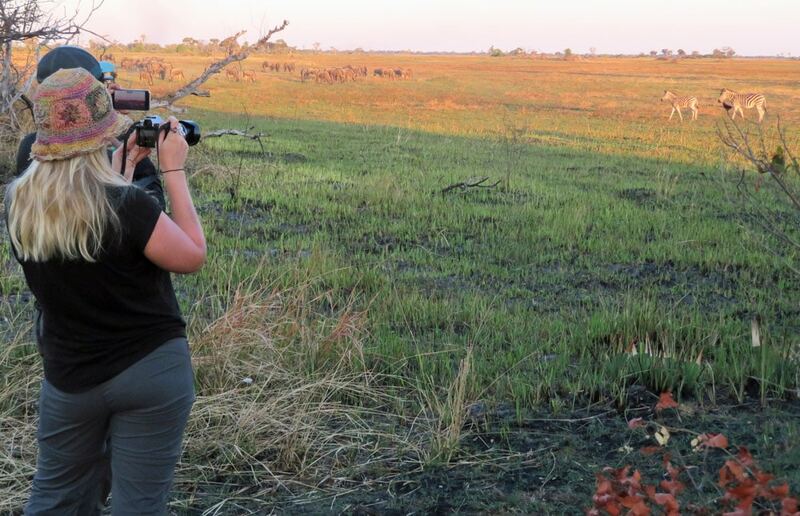 My Okavango Delta experience was one of the most incredible moments of my two months in Africa. 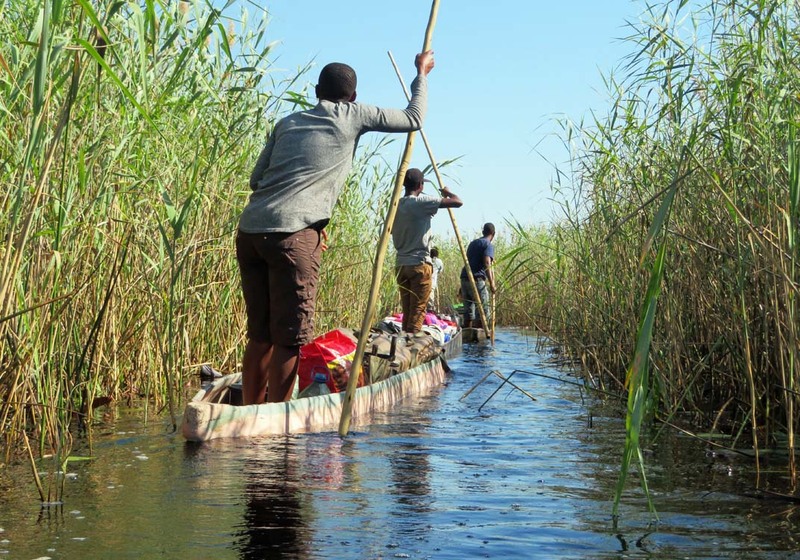 How do you get to the Okavango Delta? What is it like to camp in the Delta? Are mokoro rides dangerous? Here’s everything you need to know if you’re interested in having your own mokoro experience. 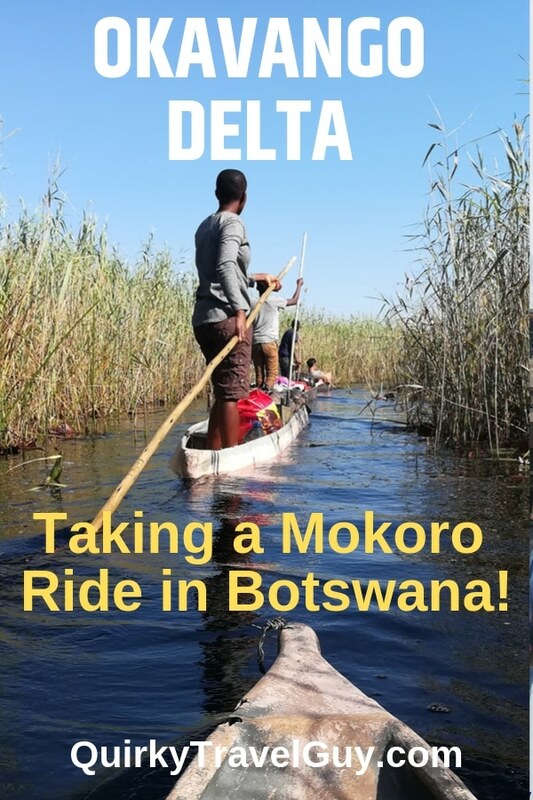 The Okavango Delta is considered one of the Seven Natural Wonders of Africa, and as a result mokoro rides are popular tourist activities. The water comes from the highlands in Angola, where January and February summer flooding sends billions of gallons of water into Botswana, where it starts arriving between March and June. 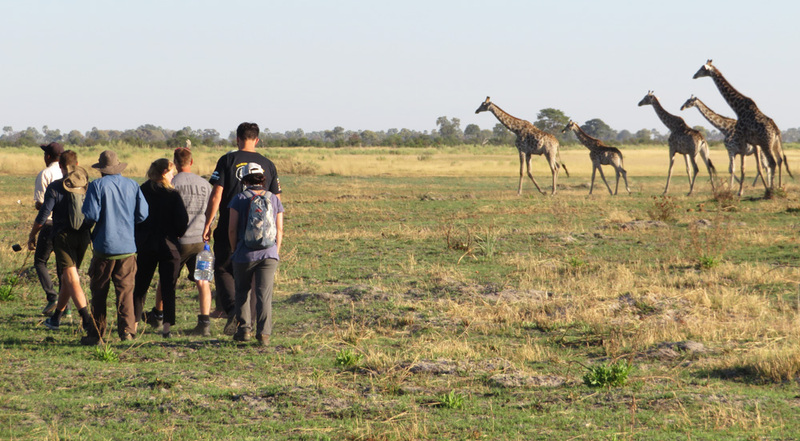 Generally, most visitors interested in seeing the area hook up with a tour company in the nearby town of Maun, which is home to 55,000 people and ranks as the fifth-largest city in Botswana. I participated in a mokoro camping expedition as part of my overland safari tour. You could conceivably drive right to the Delta and negotiate a day or multiple-day trip with the local guides who hang around waiting for visitors. But getting here is very difficult and requires a four-wheel drive vehicle and knowledge of the area’s dirt back roads, so I can’t imagine how that would be feasible for a tourist. Once your group selects a team of guides, they help you pack your camping belongings into the mekoro (that’s the plural of mokoro), and you’re off into the Delta. Some mekoro are the traditional dug-out tree type, while others are made from more sturdy materials like fiberglass. Each mokoro has one guide or poler who pushes the craft along using a long wooden pole. In most places, the water is only a few feet deep. Guides can push their pole along the bottom for leverage to keep you moving forward. We had about 14 people in our group and at least 10 guides, so the ratio was great and they really took care of us. I felt completely lost about five minutes after we set off (and that was a great feeling), but the locals know all of these channels so they can take you exactly where you’re supposed to go. Even without road signs guiding the way! The mokoro ride was very quiet. Aside from conversation, the only sounds were the swishing waters of the Delta as they were pushed along by our canoes. We paddled for at least 30 minutes through the marshes, stopping a couple times to catch glimpses of animals, before arriving at our camping location. Although water dominates the Delta, there are large sections of dry land. That’s where you’ll set up camp. There are no fences around these campsites. You’re really out there in the bush, and you are not at the top of the food chain. Our campsite was surrounded by a fair number of trees, which served as somewhat of a barrier from predators. Our fire and noise kept away the curious hyenas that had approached our campsite during the night. But still, animals can come wandering right through your campsite if they desire. In that case, you’re told to stay in your tent, since animals don’t recognize tents as a source of food. 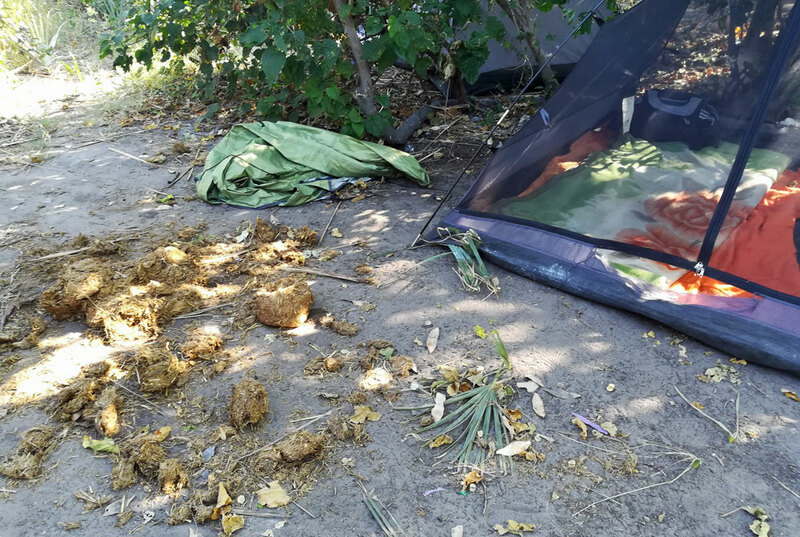 In the Okavango Delta, you may just have to pitch your tent next to a pile of elephant poo. Obviously bush camps have no bathrooms, so the camp toilet is a big hole in the ground hidden down a path behind some trees. 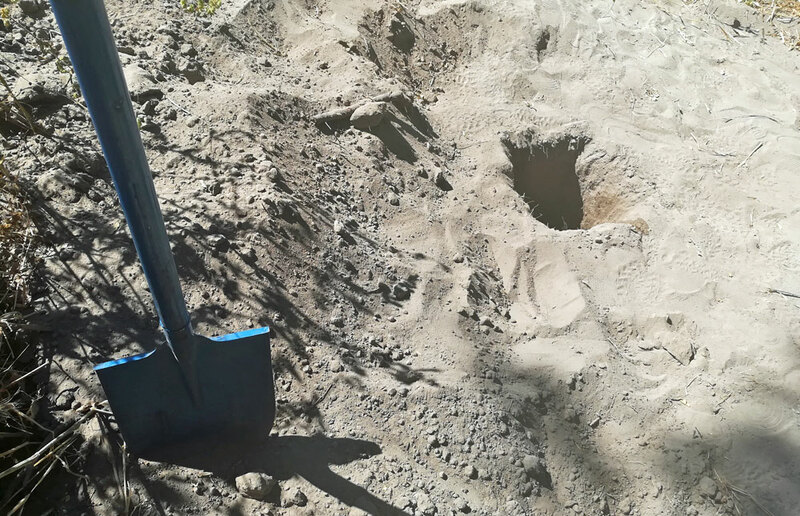 When nature called, we would grab the shovel in front of the path (if the shovel was missing, it meant that the bathroom was occupied), and head over to the hole. Here’s your fancy bathroom in the Okavango Delta! Between hikes and evening mokoro safaris, we ate meals, played games, and took a lot of naps during the afternoon heat. 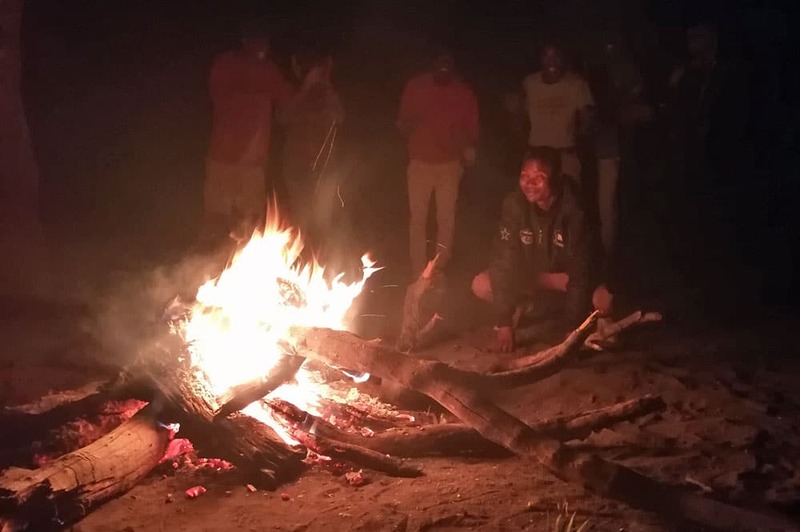 At night, our Botswana guides sang songs around the campfire and taught us Delta-themed games, including an elaborate variation of Simon Says involving African animals. The sunsets here were spectacular. Ain’t no sunset like an Okavango Delta sunset! Once it gets dark, it gets really dark, so flashlights were a necessity. We were told that hyenas came near our camp at night but were kept away by the fire. I never heard them. Sleeping out there in the heart of the African bush, miles from civilization and miles from the nearest road, was a thrill. On Day 2 of our three-day visit, we went with our guides on a three-hour hike around the area. In most African national parks like Serengeti, Chobe, and Etosha, you have to remain inside your safari truck. But here you can go on a bush hike with your guides after you’ve set up camp. This is one of the few places on the tourist trail in Africa where you can be outside the vehicle, walking around in the untamed wilderness with the continent’s fearsome predators. 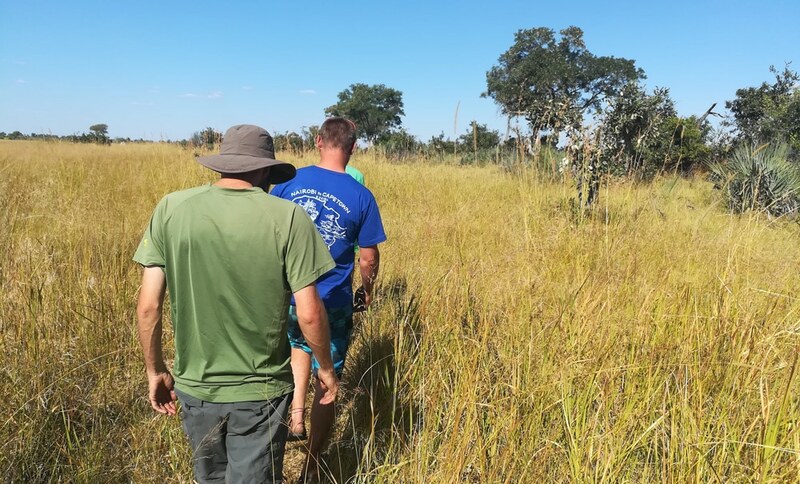 Some folks might be turned off by that level of danger, but I found the Okavango hike especially thrilling precisely because of that unpredictability. Our guides had no weapons. We were counting on the animals to run away if they stumbled upon our group of roughly 15 people. And most did – the zebras, giraffes, ostriches, and wildebeest all moved away when they saw us coming. The hippos and baboons kept their distance. The elephants didn’t run – they just eyed us closely and bellowed a warning when we got too close. We could’ve encountered lions or hyenas. Indeed, the lions of the Okavango are known for their massive size and rare swimming ability, as they’ve adapted to their habitat. 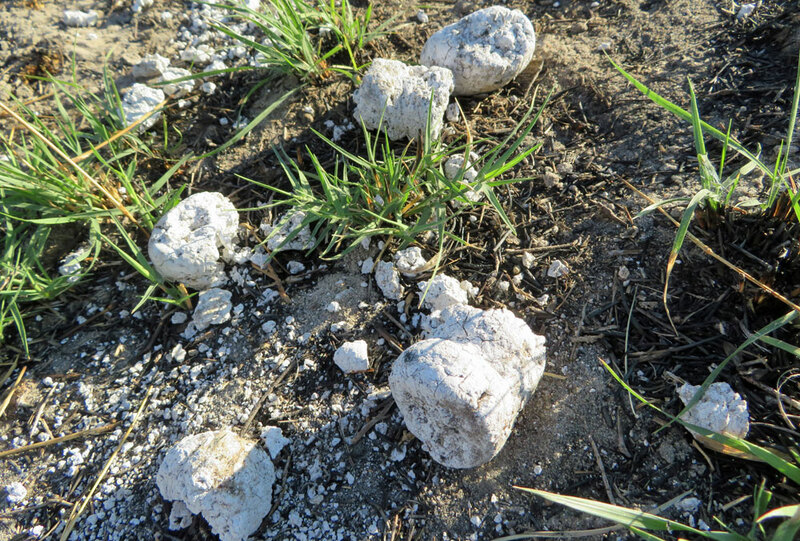 We didn’t run into any lions, although we did see lion tracks, as well as possible evidence of their presence in the buffalo bones and kudu skull lying around. Aren’t the thick, spiral horns of the kudu impressive? If you’re curious what hyena poo looks like, here it is. It’s white because hyenas eat the bones, too. They are ruthless scavengers! In addition to seeing dozens of zebras and wildebeest, a few baboons, and several ostriches, this is where we saw the giraffes fighting. We stood in awe for several minutes from no more than 50 yards away while two males bashed their necks against each other in a test of mettle. The elephant sightings were the most spectacular, as they occurred during an evening mokoro joyride. As we moved through a water channel, a herd of elephants arrived just ahead at the same channel for an evening drink. We watched while they hydrated themselves. 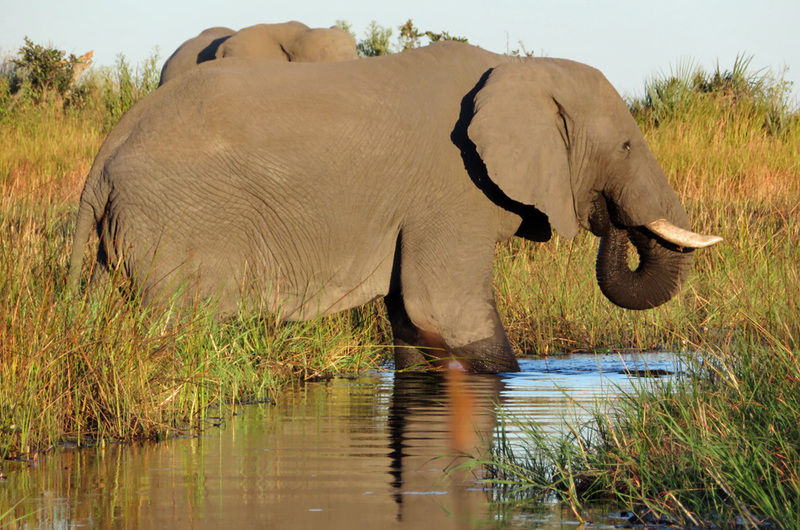 Interestingly, elephants may live longer than normal in the Delta. They typically die soon after losing their teeth, but here they can survive on the soggy grasses for an extra year or two. Cool! 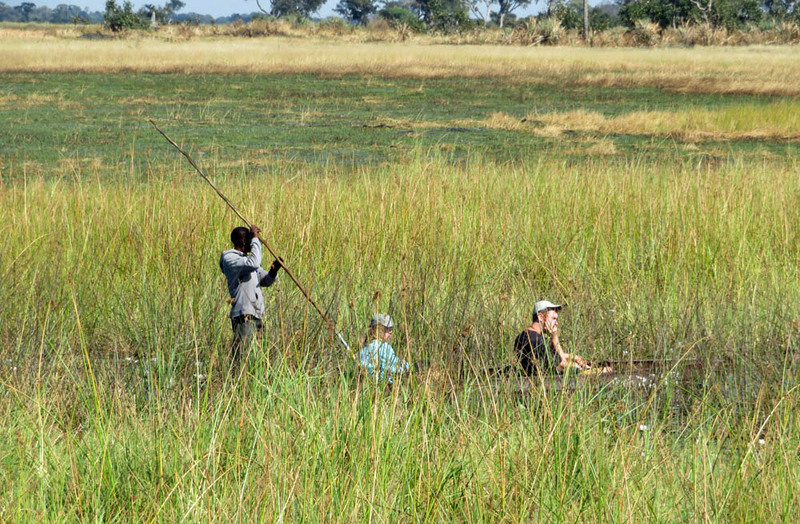 Are Okavango Delta Mokoro Trips Dangerous? 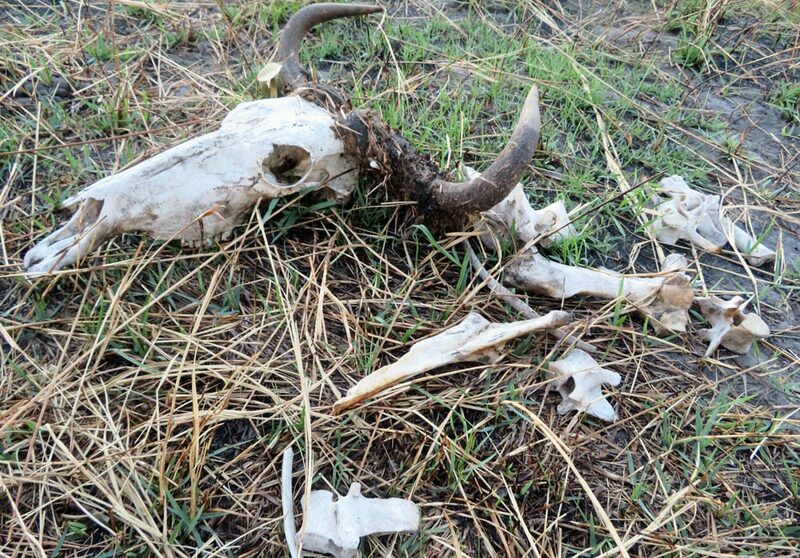 There is some danger involved in an Okavango Delta mokoro safari, more than I realized at the time. 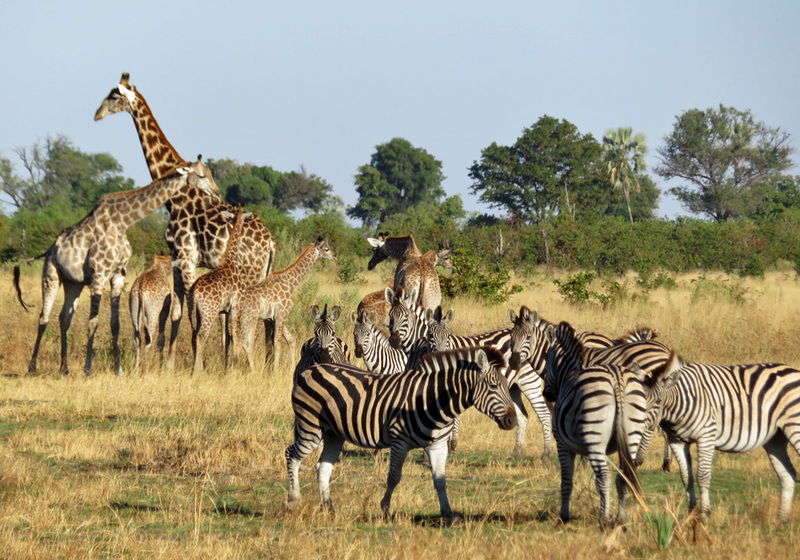 The Moremi Game Reserve overlaps with the Okavango Delta, so wildlife of all kinds is abundant, from birds to big game. Of course, lions, leopards, and hyenas are predators that could in theory take down a human, and elephants and giraffes are massive enough to do serious damage. But the biggest threat is hippos. Hippos kill more humans than any other animal in Africa. They can lurk beneath the surface in only a few feet of water without giving away their presence. Hippos reside in some of these waters, and they’ve been known to attack mokoros, sending people scurrying for dry land. As I noted during my recap of the most amazing animal encounters I had in Africa, just as I finished my mokoro ride and saw the next tour group begin heading out into the Delta, a hippo began chasing after them. No one was hurt, but it was incredible to witness. 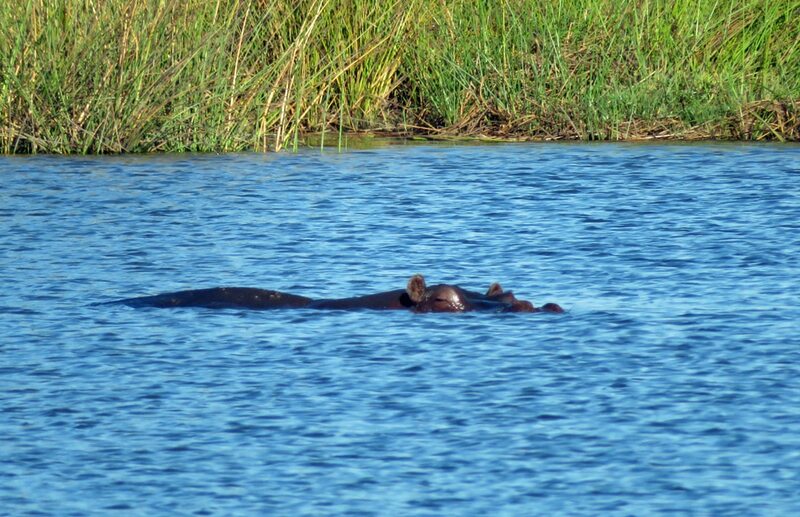 Further online research reveals numerous stories of hippo attacks on mokoros. 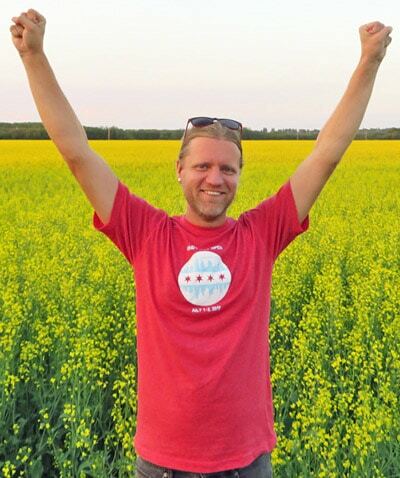 Romy from Brunette at Sunset wrote about her experience. Others have posted similar accounts. Almost all of the stories end with “we escaped unharmed,” though that probably doesn’t offer much reassurance to those who had to go through the ordeal. So there is definitely some inherent danger involved in a mokoro trip like this. These guides have been navigating these waters for years, and they’re going to do their best to keep you safe. In life we can only do our best to minimize danger, and then it’s up to fate. I’d still do a Delta mokoro trip again in a heartbeat. Here’s a YouTube clip of a hippo chasing after a mokoro in the Delta a few years back. This is not my video, but it’s pretty close to what I witnessed. Okavango Delta weather seems to be best from June through August. This is winter in southern Africa, but temperatures still average around 70 F. It’s also the dry season, so you won’t have to worry about rain. And the Delta waters are highest, because it takes that long for the summer rains in the Angola mountains to make their way down to the Delta. What is the etiquette regarding tipping? 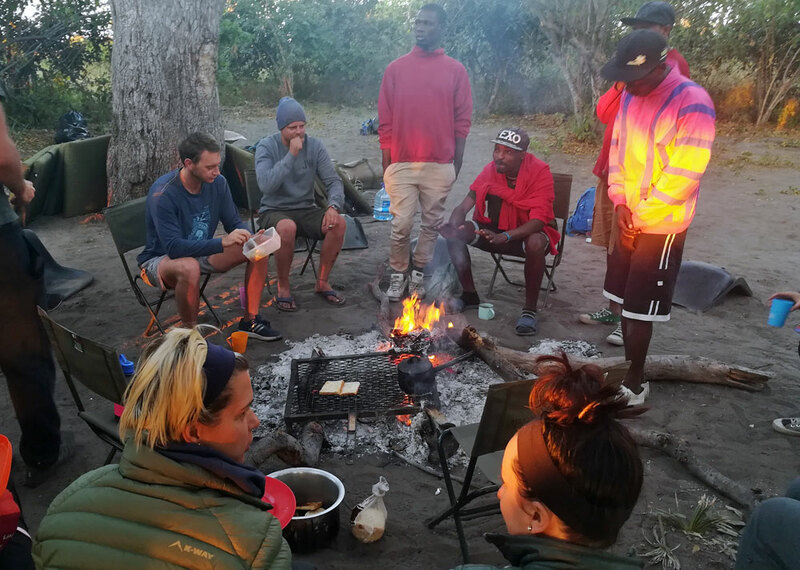 Mokoro guides do expect tips, and after seeing how they transport you to and from the campsite, cook your meals, and lead the hikes, you’ll definitely want to give them a little something extra once the trip is over. Tipping in U.S. dollars is acceptable, but Botswana Pula are preferred, so try to bring extra Pula with you when you come. Most in our group chipped in $10-20 US, which we pooled together as a tip for the group of guides. Where can I see an Okavango Delta map? Google Maps isn’t particularly helpful on this one, because they show the entire area as green forest instead of blue water. That makes sense since the amount of water varies by season. But this one is one of the better Delta maps I’ve seen, showing the locations of various campsites in the area, such as Savuti Camp. 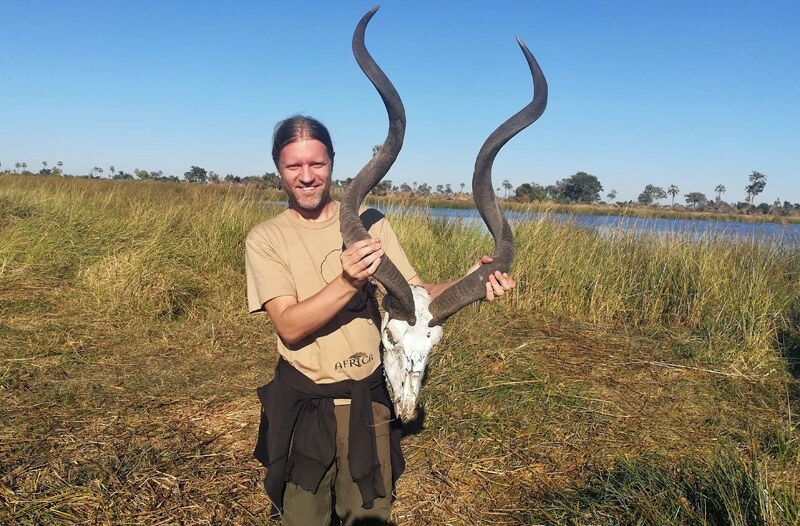 What should I bring on an Okavango Delta trip? Bring the obvious – food, tent, sleeping bag, warm clothes, bug repellent, sunscreen, your malaria medication, and basic toiletries. Don’t forget your camera (I used my Nikon DSLR and an affordable Canon Powershot) and a phone if you like, although you won’t have cell service out here. If you’re staying for multiple days, see my African safari packing list for more suggestions. Can I take a day trip to the Delta from Maun? 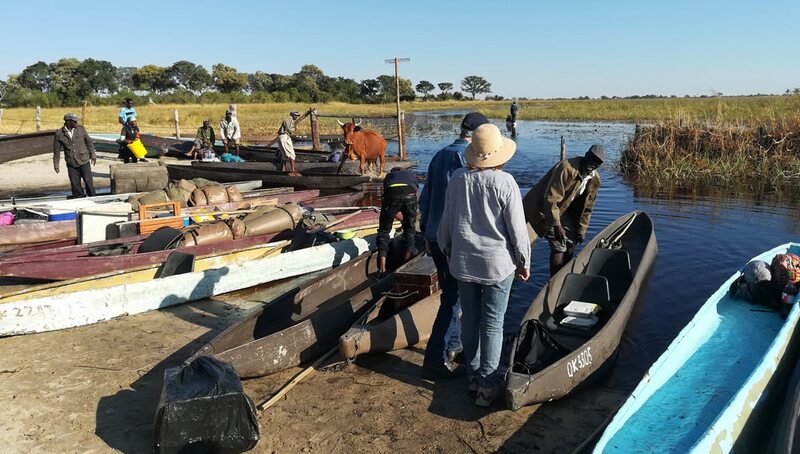 Sure, there are some Maun Okavango Delta day trips that will allow you to go out into the Delta in a mokoro for a couple hours and then return the same day. 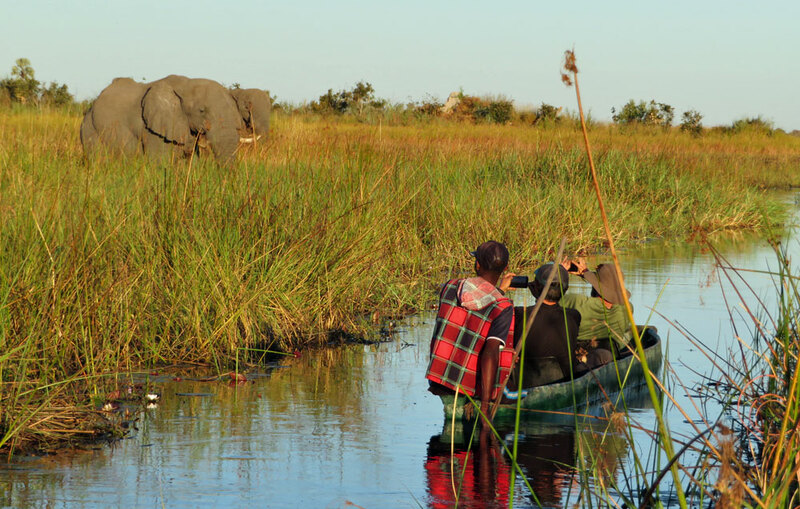 Just check with the tour operators in Maun for Okavango Delta tours. 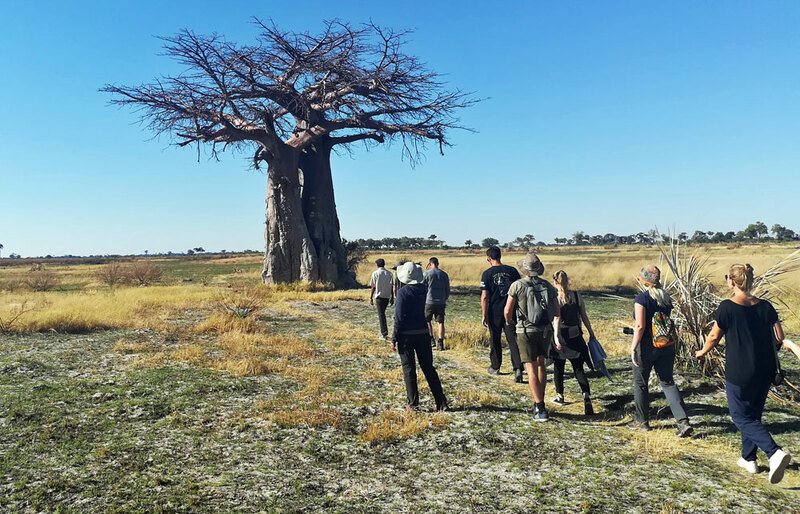 You can also book online with companies like Viator and Tour Radar, or local Okavango Delta lodges that offer day trips, such as this one. Can I book a flight over the Delta? Yep! If you’ve got the cash in your budget, you can arrange a small flightseeing excursion to see the Delta from above. You’ll get a sense of the vastness of the swamp, and you’ll probably see herds of elephants and other game animals during the flight. Here are some flight company options. 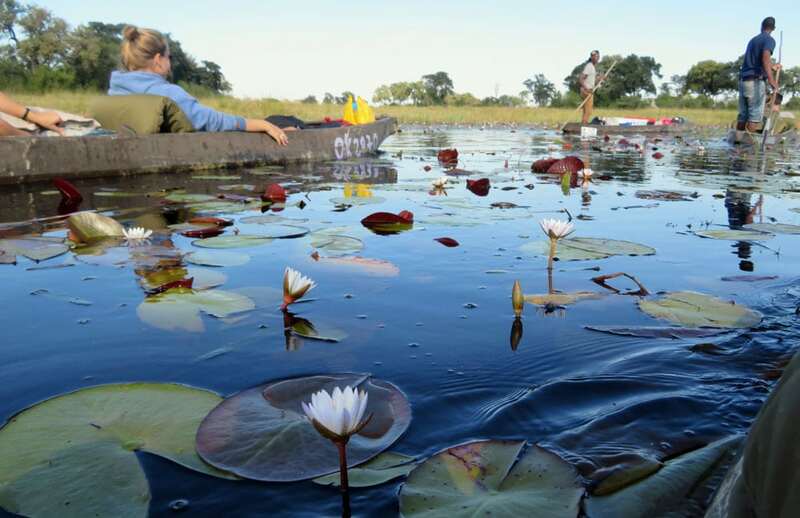 Okavango Delta accommodation ranges from extremely upscale guest houses to wilderness camping. The latter is essentially free, but you’ll need to pay your mokoro guide to get you out into the bush. Most of the hotels and lodges you’ll find will be in the city of Maun. Options include Senthaga Guest Lodge, Thamalakane River Lodge, Queness Inn, and Rivernest Boutique Cottages. For many more options, try searching booking.com. 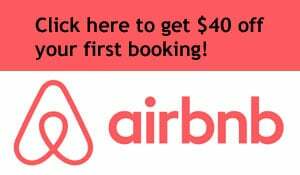 I highly recommend this site because they do the best job of aggregating hotels around the world and presented the best deals for your dates of travel. 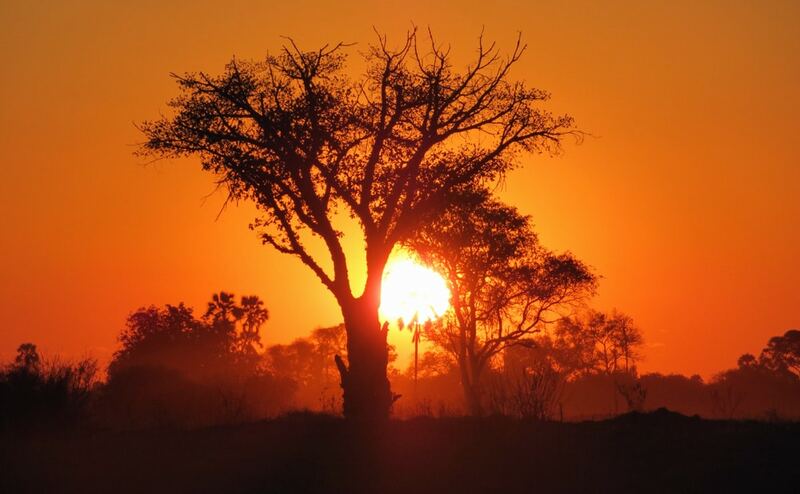 Click here to search for hotels in the Okavango Delta area on booking.com. If you’re as fascinated by the Okavango Delta as I am, check out this 50-minute documentary on the lions and other wildlife of the area!